I love the ritual of making New Year's Resolutions. No matter how many times I fail (and sometimes succeed) in achieving my goals, I love the process of clarifying my vision for how life could be, fulfilling my aspirations to be a better person in all ways. In recent years I have used the "Getting Things Done" process as taught by David Allen, a highly useful tool. This being the week between Christmas and New Year's Day, I have the added (and not typical) luxury of being on vacation. Perfect for pulling out the paper and writing my lists and goals. Yet as perfect as conditions are, I can't seem to pull it off. The truth is, I am exhausted. Specifically, I am exhausted on a spiritual level. There are good reasons for this exhaustion. Because it involves another person, I won't go into details. Suffice it to say, during the last two months I have had the opportunity to be of service while God saved the life of someone I love. This is the answer to prayers over many years-- my own, and others, for this person in need. Finally, after years in the Pit, he was able to let go and say Yes to help, and by the grace of God and perfect timing, I was able to respond and help line up resources for this person. I would do it again in a heartbeat, but I confess the whole process was made much more difficult by my own fear, anxiety, and worry. Despite my willingness to be of service, I can't say there was no static on the line between me and God during all this drama. People, it all came together. And it was a series of miracles that left me bowled over with the knowledge of God's love and Grace in our lives, if we would only trust. So once again in God's economy I see how in being of service I am also being blessed and healed. Grace upon Grace, that's all. So anyway, I have been reading (providentially) Thomas Moore's new book "A Life At Work: The Joy Of Discovering What You Were Born To Do", in which he shares his insights on the life of the Soul and Spirit as it relates to doing our life Work. He talks about job and career through the lens of finding meaning for a life well lived. The terms "Soul" and "Spirit" are often used interchangeably, yet Moore shows us that these are two aspects of self with very different impulses and purpose. It is our Soul that connects us to depth of feeling, meaning, personal history, family and community. Soul work is intimate and slow and evolves over time. Soul does not care so much for the Ego concerns of success and failure as defined by society. In the world of work or career, a Soulful job makes us feel nourished by the work, whereas a job without soul makes us feel empty or dead inside. It is Spirit within us that is aspirational, where we cultivate a vision for the future and how things could be. Spirit brings energy and vitality, creativity and spark to what we do, either at the job or at home. A Spirit that is satisfied by work has something to contribute. A spirit crushing job is one where creativity is unwelcome, where one feels like a "cog in the machine"--interchangeable and bored. As I anticipate the New Year, contemplating this duality of Soul and Spirit brings a welcome perspective to the usual ritual of making "resolutions". Instead of being frustrated that I cannot charge ahead with my Ego, writing up a laundry list of Things To Do and Be, I see the gift in being just plain too tired. I see that the last two months have been deeply tiring to my Spirit, not because it came from my Ego, but because my Ego did not quite trust enough. In other words, while my Spirit was working, my Ego was also trying and interfering and making it Hard. Now that the crisis is over, I see how my Spirit needed to learn this lesson. Does that make sense? In these days of Christmas and after, I find myself reflexively doing Soul feeding work, while my Spirit takes a rest. I rest in the bosom of my family. I revel in the presence of my husband and grown sons. I gaze in joy at the nine month old face of Joshua, my nephew's new son. I hold him and feel him push his tiny feet into my abdomen, getting ready to stand and walk someday very soon. I bake gingerbread cookies and let their sweet aroma of cinnamon, ginger, and cloves transport me to Christmas both past and present. I look at the lights and familiar ornaments. I hum the carols. I sweep and mop the floors. It is all so very good. This year, when my Spirit revives (and it will), there will be new resolutions and a new vision for the Work God has in store for me. I intend to face it with courage and discipline, (virtues I confess I have often lacked). But this time, as I follow the promptings of Spirit, (and writing this essay is one such prompting), I won't leave the slow, grounded and humbling work of Soul behind. There's been a bit too much Heroics for that, and it simply has not worked for me. The yearnings of my Spirit must be answered if I am to have a full Life. However attending to the balance of Soul and Spirit in my life may make it a little less likely that my Ego will assert itself and hijack the horse I am riding into the sunset. That's my prayer, anyway. Have a Spirit filled, Soulful New Year everyone! When I saw that Mark Bittman, one of my favorite food writers, had come out with a new book called "Food Matters; A Guide To Conscious Eating", I was frankly a little skeptical. Hasn't Michael Pollan pretty much said it all? Do we really need another socio-political look at diet that tells us to "eat food, mostly plants, not too much?" Turns out, there is quite a bit more to say about the medical, socio-political and especially the environmental effects of the standard American diet, and, more importantly, what a large-scale change in that diet could mean both personally and to the world at large. And Mark Bittman, with his straightforward, very readable and instructive style of writing, is just the writer to do the job. This is a timely book for the masses, and hopefully the coming generations. In Food Matters, Mark Bittman finally tells us specifically what to eat, and with 75 recipes, how to prepare it. He does it without dogma, self righteous proclamations or notions on what constitutes "good vs. bad" food. NO food is banned from the diet, although he shows a distinct preference for the wholesome and natural instead of processed foods. And he suggests a way of eating that is reasonable, logical, healthful, satisfying, much more ecologically sustainable, and above all-- achievable by anyone with even a modicum of self-control. Not bad. In fact, if ever there was a diet recommendation for the modern world, this book is it. The first few chapters lay out the relevant facts about what the standard American diet has become, and how it got there through marketing and governmental collusion with agribusiness and "big food". In particular, Bittman does the math for us when it comes to the beef industry, and other industrial food production methods that are gigantically wasteful of natural resources even as these meat-centric foods provide less calories and more health challenges for the effort. Of particular interest, Bittman connects the dots between ubiquitous hamburgers and global warming.We ignore these basic facts at our peril. One might assume that Bittman preaches a vegetarian and sugar-free lifestyle as the only viable alternative. But that's the genius of Mark Bittman: He knows that human beings, himself included, are not inclined to give up foods they love. This man is a food writer, remember. He knows what is delicious and what people want to eat. So rather than presenting an either-or scenario, he takes a moderate and much more workable approach that he calls "less-meatarian." Instead of giving up meat entirely, what would happen if one simply consumed a statistically significant proportion less of the meat and processed flour and sugar that dominates the typical diet? Bittman's method is this: as a general rule, eat only whole grains and vegetables during the day, and consume what you want (meat, fish, refined flours or sugar) at night, and be moderate about it. His personal result eating this way was a significant reduction in weight, lowered blood pressure and other important markers of increased health and vitality. All without a depriving himself of any particular food. He also greatly reduced his food bill. Sounds good to me. I happen to know this method works for me, because I have used a variation on this program myself in the past with success. This was during a time when I was cutting back on refined grains, specifically bread. My personal rule was, to substitute either vegetables or (more rarely) fruit wherever I might normally eat a piece of bread. I did this until dinner, when I would allow myself to eat some kind of carbohydrate with the meal-- whether that be a slice of bread, a roll, or pasta. And not too much. That simple dietary adjustment had me feeling very healthy in no time. For lunch, instead of a sandwich I had a salad with pieces of meat in it, and an egg with vegetables for breakfast. For several years, I simply gave up cooking pasta altogether. Now, my family enjoys the occasional pasta meal, with the amount of pasta on the plate much more of a side dish than the main attraction. Coincidentally Mark Bittman also recommends reversing the proportions of pasta and sauce compared to the standard pasta-dominant dish. (Less pasta, more sauce). Over and over, I find that Bittman's approach to food is eerily similar to my own, only he is a much more knowledgeable and experienced cook. No doubt this is why I find him to be my favorite teacher when it comes to food. Just as Mark Bittman noted in his book, this pattern of eating flouts (and reverses) the usual recommendation that the heavier meal be eaten in the morning, while the lighter (perhaps meatless) meal be eaten at night. But the fact is, I find it much easier to be disciplined about my diet during the day. At night, after work, I like to relax and indulge myself a bit. This usually includes my one glass of wine with dinner, and that one glass is just enough to weaken any resolve I have about dietary abstinence. And I like to have some dessert after dinner, usually a home made baked item such as a cookie or two, or a slice of cake. (If I have to bake it, and don't buy it, I don't eat so much sweet stuff.). Thus: it worked for ME to be disciplined with diet all day, and less so at night. To heck with common wisdom, I did what worked! It looks to me like Mr. Bittman found the same routine true for him, only he includes avoiding meat in his day-time regimen. He has convinced me that cutting back on meat is not only healthful and wise, it is good for the environment and for industrially raised animals as well. What if the entire population of the the United States suddenly reduced their meat consumption to one third, and replaced it with vegetables? The social, medical, environmental and economic changes would be enormous, and for the better. This is what is required for a sane way of eating, as Mark Bittman has outlined so well in his book. And with 75 recipes to get you started, you can begin immediately. Because Food Matters. A lot more than we will ever know. I have been procrastinating writing a review of this book for weeks, simply because I have been afraid I would not be able to do it justice, and it pains me to think I might lose the opportunity to persuade even one person from taking a good long look at this magnificent volume. The River Cottage Meat Book could be (and certainly is for me), life-changing. Life changing not only for us as consumers of meat, but for the quality of life for the animals consumed. Given the despicable conditions of existence for the vast majority of creatures raised under the practices of industrial farming, this book has the potential to convert many people into informed and enlightened shoppers, who will learn to vote for humane animal husbandry practices with their grocery dollars, thus changing the marketplace permanently for the better. After reading this book, I have a new sense of the power to effect positive change and to bring an end to the untold suffering of millions of animals. That alone makes this book important. 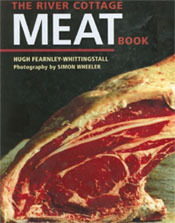 The River Cottage Meat Book is written by Hugh Fearnley-Whittingstall, a British chef who resides at River Cottage where he raises and prepares a vast variety of meats (and other foods) with the utmost respect and quality. In his book, he shares his encyclopedic knowledge of the sourcing, preparation and cooking of meat in a straight-forward, engaging and simple (but never simplistic) manner. He includes everything from poultry, beef and pork to game, fish, and the use of offal (pig's trotters, organ meats etc) and each is discussed in depth. It is a spectacular achievement. If you eat meat, this book will provide the foundation of everything you will need to know in order to recognize and prepare meat with the quality worth consuming. And the most important facet, indeed the essential core, of this book, is the profound and thorough consideration of the ethics of how we treat animals we intend to consume. For the humane treatment of animals and the resultant quality of the food that results are inextricably intertwined, as this book makes evident in every detail. Recipes and cooking techniques are plentiful for each type of meat. The book is handsome as well. It is illustrated throughout with photographs of the animals, both in the field and not shrinking from the essential facts of butchering, hanging, carving and the like. One never loses sight of the sense of gratitude the author has for the life of the animal raised for consumption. How much more wholesome this is than the uncaring and cynical detachment toward animals that is fostered by the common grocery market and fast-food industry! This book epitomizes my argument with vegans and vegetarians, who maintain that the only ethical answer to the animal cruelty of industrial farming is to refuse to consume meat at all. In fact that very argument is lived out daily in my own kitchen, for one of my sons is a vegan solely due to his refusal to collude with animal cruelty by eating meat. I certainly respect his intentions. However, my argument is that the industrial farming companies do not care in the least if my son is a vegan, for his decision renders him irrelevant to them. The odds of vegetarianism becoming the norm, world-wide, is virtually nil. On the other hand, if vast numbers of shoppers refuse to buy meat raised under cruel conditions, and are willing to pay more for the humanely raised (and higher quality on every level) organic alternative, then social change is inevitable. Surely that is worth doing, and the sooner the better! By far, the type of meat I purchase most often is chicken. The River Cottage Meat Book discusses in detail what the term "free range" means, in real terms of square footage of space alloted to each bird, and whether or not the term is meaningful to the bird's quality of life. He discusses a variety of practices and how to read labels in order to get a product that is actually superior, not just a marketing ploy to assuage the conscience of the consumer while continuing to maximize profits at the bird's expense. Fearnley-Whittingstall discusses these issues in all their complexity so that a truly informed buying decision can be made, up to and including raising one's own poultry. The River Cottage Meat Book will have you looking for a good local butcher, and will help you know what kinds of questions to ask to determine if he or she is competent to serve you well. This book reaffirms my decision to purchase the highest quality organic meat products I can afford, not just because it tastes better, but because it is the right thing to do. The higher prices can be offset by eating less meat in general and increasing our consumption of vegetables, fruits, and grains. The River Cottage Meat Book may not have you asking the butcher for pig's trotters or hanging fowl in your garage, but it will arm you with the information you need to eat well, respect the creatures you consume, and provide fascinating reading for the interested cook. In short, it is a classic, and a book for the millennium. I am a book lover, including an old charmer like this vintage tome I picked up for a few dollars at a used book store a couple of years ago. 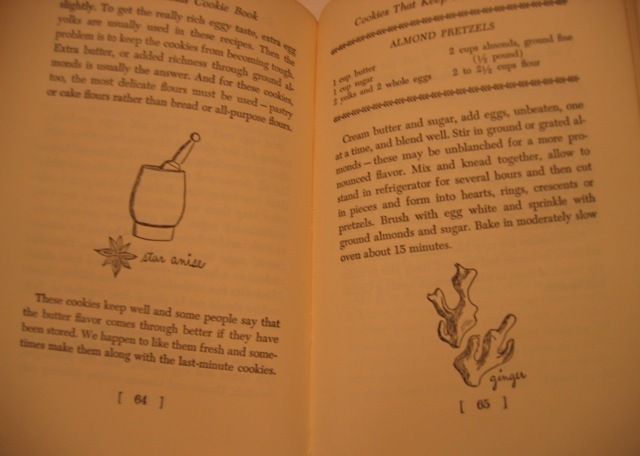 It is in remarkably good shape, given its publication year of 1949, with very few of the smudges and stains that usually decorate a cook book that has been well loved. 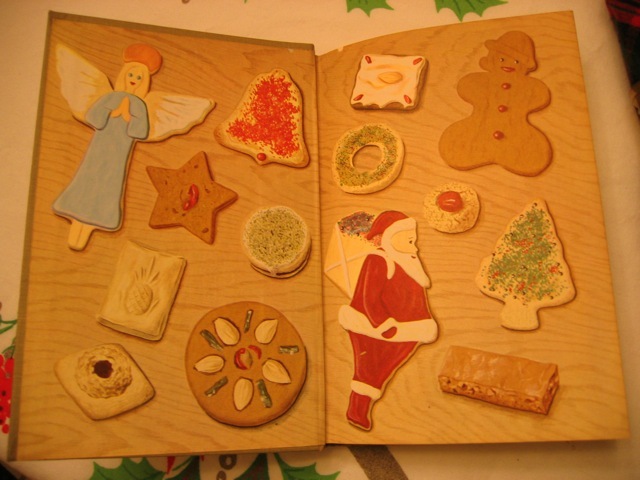 The Christmas Cookie Book was written by Virginia Pasley and illustrated with line drawings by Barbara Corrigan. The text describes in glowing detail the author's family tradition of baking a huge variety of Christmas cookies, often starting right after Thanksgiving and continuing through to Christmas day. The contents feature Cookies that keep, cookies that keep a little while, cookies in fancy shapes, cookies that won't keep, and more. 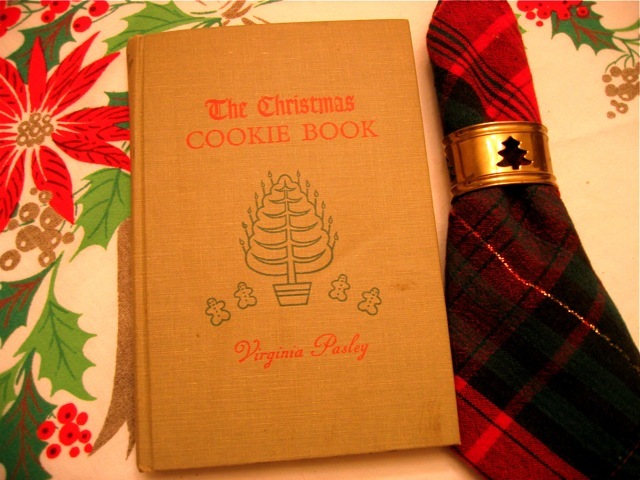 Our family has a Christmas cookie tradition too, although not nearly as elaborate as the one described in this book. 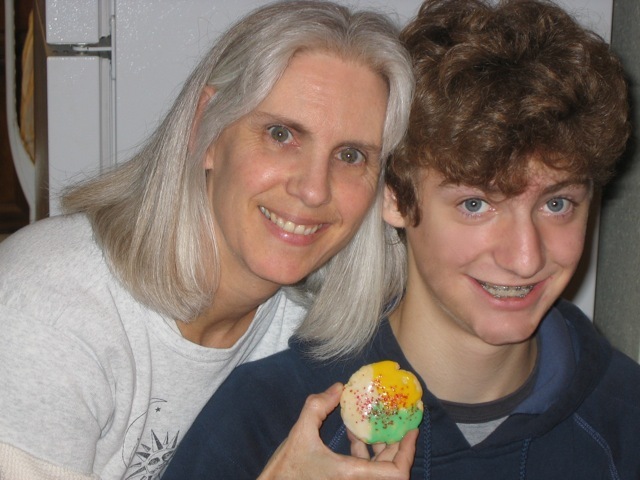 We've done the cookie routine since our sons were little boys, skipping some years when we let life get too busy. The recipe was always the same: a basic sugar cookie from my Good Housekeeping Cook book, which we cut into shapes using the cookie cutters my Mom had used, as well as a few new cutters I had purchased here and there. The real fun was in the decorating, though. 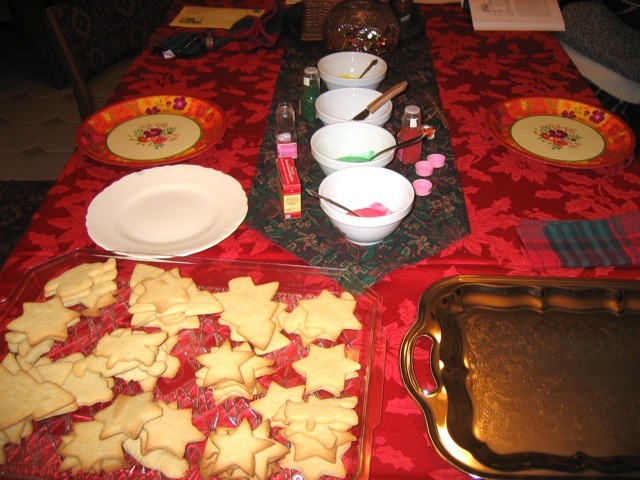 A big bowl of white frosting was divided into four smaller bowls, and colored with red, green and yellow food coloring. This just never gets old, even when the boys are now grown. Did you ever see the Simpson's episode where Marge chastises Bart for making the Christmas tree cookies look like "bloody arrow heads"...? 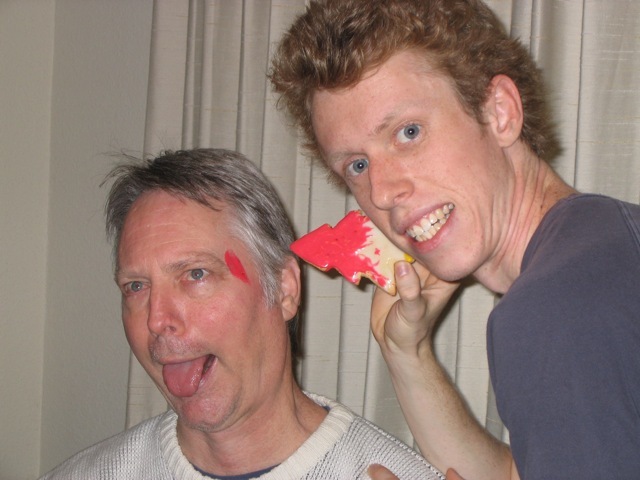 That's our son Evan (now age 22) demonstrating this concept with my husband Jim. I was tempted to leave the "red eye" artifact in the photograph in Evan's eyes, but thought better of it and edited it out. But you get the idea. 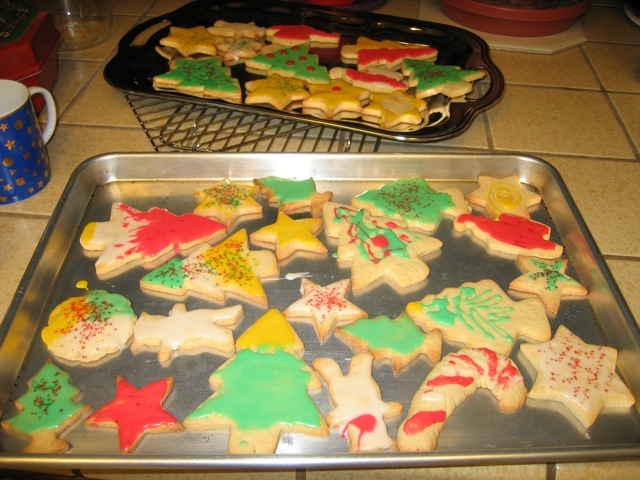 Christmas cookies are fun! At any age. Last weekend I went to my first ever Cookie Swap, hosted by my pal Garrett of Vanilla Garlic. We had a blast, and my own cookie baking will never be the same. Traditions are wonderful, but I am learning that just because something is a tradition, doesn't mean that it has to be exactly the same year after year. Twenty years of sugar cookies and colored frosting is enough! I aim to hunt down several of the recipes I enjoyed from the cookie swap (I'm looking at you, Kate!) and make them part of our tradition here at home. They were SO GOOD! I made persimmon cookies for the swap, and I was quite relieved that they came out just fine, having narrowly avoided disaster when my recipe failed me the night before. Cooking with fruit pulp can be tricky, and I had to add flour and increase the oven temperature significantly before the cookies came out right. That was a little scary. The moral of the story is: Bake cookies! And don't be afraid to update your traditions, or start new ones this very day. It's never too late to start. The photograph above was not taken from my visit to the Quixote Winery in Napa last Sunday, but it is because of that day that I made sure to stop by the abundant cheese department at Whole Foods on Wednesday and make a selection. 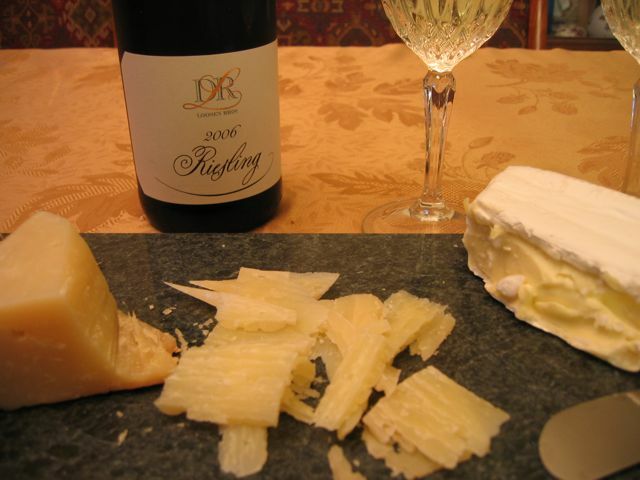 And while my initial pairing of wine and cheese was not perfect, it made a delightful interlude for my husband and I to enjoy while the Thanksgiving turkey finished roasting and before we began the traditional feast with our family. Janet Fletcher, the author of Cheese and Wine; A Guide To Selecting, Pairing. and Enjoying has converted me. I will no longer walk wistfully past the cheese department, waiting for a special occasion to prompt a purchase. Much of the European world (France, Italy, Spain, Greece) where milk and grapes are abundant, enjoy a daily ritual of wine and cheese, and it is my pleasure to join them--with Janet's blessing and guidance. Each cheese was delicious, a festival of textures and flavors, creating a kind of dance on the palate as I nibbled and sipped back and forth between the cheeses and wines. It was pretty much Nirvanna for the taste buds, and I privately vowed to stop neglecting these powerful opportunities for pleasure in the future. Life is too short to drink crappy wine and dull, uninspired cheeses, I thought. Not when these affordable luxuries are so close at hand. At the Quixote Wine tasting, we were also gifted with a signed copy of Janet's latest book (named in the title of this post), which delivers on its promise to guide and educate the reader who, like me, can be overwhelmed and bewildered by the array of offerings at a well stocked cheese counter. Janet Fletcher can be your guide too not only through her books, but through her weekly column on cheese published through the San Francisco Chronicle. (Here is the url for her Cheese Course article archive. You won't want to miss her current article on Splurgeworthy Selections for the Cheeseboard). Her advice and writing has been awarded two James Beard Awards, and has been featured in magazines such as Food and Wine, Bon Apetite, Fine Cooking and Metropolitan Home. What I appreciate about Janet's book is her very straight forward, informative style of writing that is precise and helpful in its descriptions of the character of the various cheeses, as well as pertinent information on why a cheese would work better with some types of wine and not so well with others. Her introductory chapter is richly inspirational but quickly moves on to instruct on how to store, serve and enjoy cheese in a variety of settings. Cheeses are categorized in terms of milk source (cow, sheep, goat, or mixed), how they are made (fresh, aged, pastuerized or not, and other such considerations) and other relevant details to quickly orient the consumer. The book is well indexed, and each cheese profile is accompanied by a simple icon to indicate milk source (cow, sheep, goat, etc.) as well as a pronunciation guide for foreign words which I find enormously helpful. Finally, Cheese and Wine is gorgeously illustrated with photographs by Victoria Pearson of cheeses, wines and serving pieces and makes it an absolute delight to turn the pages. In short, it makes me want to eat the book. (Memo to holiday gift givers: this book or others by Janet would be welcome under the tree). In my foray into the cheese department at Whole Foods, not having yet read Janet's book, I chose a sheep pecorino stagionato, which was a safe choice because I already knew I enjoyed pecorino. Then I went to the wine section and, at the advice of the head of the wine department, chose a Loosen Brothers 2006 Riesling from Salem Oregon to enjoy at Thanksgiving dinner. At home, I turned to the page in Janet's book on "Pecorino Toscano" and learned that this is an Italian sheep's milk cheese that has been produced for 2,000 years. The kind I bought, "Stagianato", is a type of pecorino that is aged for at least four months in a cellar. I found it to be buttery, chewy, dense and salty, and very delicious. The wine I chose was also very good, although a bit sweeter than I prefer, and perhaps too sweet for the pecorino. The wine was juicy and tasted brightly of the grapes, exploding in the mouth. The finish was brief and added to the sense of surprise, as the sweetness and acidity of the wine both spoke at the same time with each swallow. This is a low alcohol wine, slightly over 8 percent, a very light straw yellow in color. In the future I would probably prefer to pair it with a fruit dessert after the meal. I served the pecorino with a rather unremarkable brie. Incidentally, Janet's book suggests that instead of chopping off the tip of a brie as it is consumed, (as I did with the one pictured above), one should slice off thin wedges along the edge in order to preserve the triangular shape of the brie. That's just one of many helpful suggestions that Janet makes in order to enhance to pleasure of eating cheese, even though it doesn't affect the taste per se. Sitting next to Janet at the cheese and wine tasting, I told her I am the grand daughter of dairy farmers on both my mother and father's sides of the family. I was born in Cuba, New York, home of the locally famous Cuba Cheese Shoppe, and I have always wondered if my grandparents' dairy products provided the source of milk that the cheese makers used. On many occasions Cuba Cheese has been a coveted Christmas gift, mailed out to we in the family who migrated west. Now I want to taste it all over again and learn more about it. (My favorite is the white cheddar). Tasting the cheese and wine last Sunday, and in the days since then, has felt like coming home to me. Coming home to my heritage in a new way, and to a recovery of pleasures lost and rediscovered. Not a bad way to celebrate Thanksgiving. Not bad at all. How's your foodie cred? Can you hold your own in a conversation where the culture of food is the passionate subject? If you could use some help, or better yet if you are fascinated by food ephemera and want to add to your store of lore and trivia, get your hands on a copy of the small but packed little volume titled How To Be A Better Foodie; A Bulging Little Book For The Truly Epicurious by Sudi Pigott. Even if you don't identify with the term "foodie", the book lives up to its title by providing the reader with page after page of interesting food facts that only a lover of food would appreciate. Like a cross between a dictionary and a personal encyclopedia, the information contained is lovingly culled more from the author's own food explorations, than an attempt to be as comprehensive as the giant and classic Larousse Gastronomique. As I peruse the pages, I feel I am receiving the distilled wisdom and advice from a knowledgeable foodie friend about "where the really good stuff is". The book does have a chatty "be in the know", magazine-style vibe, with chapters on cooking must-haves, wish lists for the kitchen, and a consistent focus on the avant-garde and trendy, such as "Trophy extreme seasonal delicacies". But again, rather than offend me with a snootier-than-thou attitude, the author goes on to provide the goods in terms of cutting edge information that was truly new to me. She seduced me with her ability to satisfy my inner food trivia geek, and make me turn the pages for more. Some of the information is admittedly obscure. Here you can find out where they eat lamprey as a delicacy, (Finland), what other foodies eat in the far-flung corners of the globe, and a detailed list of offal that, by another name, is a gourmet treat. But there are handy lists too, such as movies that every foodie ought to see, (naming several titles that were beyond the obvious), how to select high quality foods, and what constitutes good table manners in a variety of settings. The author answers questions I would never have thought to ask. Bottom line, it's a fun read. This is not a coffee table book plastered with luscious food photography. In fact, there are no pictures other than minimal illustrations, and pages punctuated with lively quotes. The book is cleverly designed in a two-tone chocolate brown, pink and white color scheme that suggests a box of chocolates. The design is fitting--this is mind-candy at it's best: serving up delicious little morsels to be nibbled at over time, the reader finding it hard to stop at just one page. With the holiday gift giving season approaching, this little tome could easily go on your "good to give or get" list. Now that I have finished reading Harry Potter and The Deathly Hallows, my self-imposed media blackout has been lifted, and I can read blogs again. Yes, it's paranoid, but I was so afraid that I would stumble across a plot spoiler on the internet, on TV, or in the news, I swore off media for a week until I had a chance to finish the book. My son Ethan was reading the book too, while I was at work during the day. It was fun to watch our two bookmarks play leap frog over one another as we both worked our way through the chapters, first my being in the lead, then my falling behind, then Ethan, then me again, until we both finished and could speak freely about the story. Unless my husband Jim was in the room--then we clammed up again. We were all very careful, asking "where are you now in the book?" before saying anything, or simply nodding with an enigmatic expression, betraying nothing. One of the most enjoyable elements of the Harry Potter universe was, of course, FOOD. 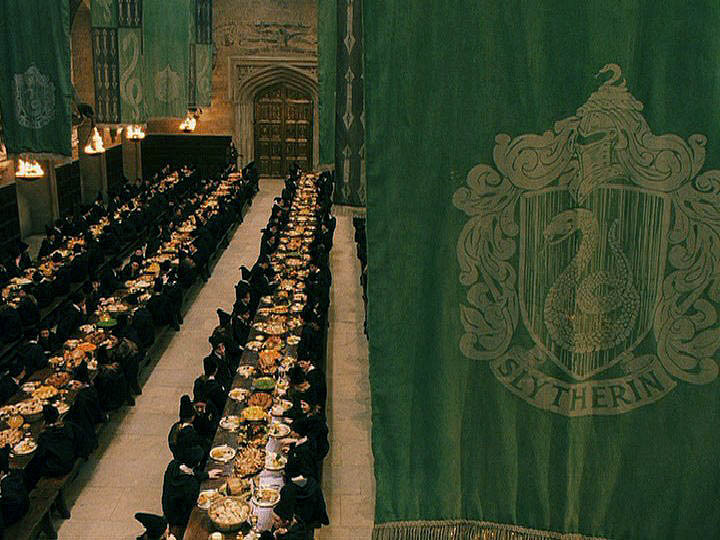 Whether it was a chocolate covered frog, or Bertie Botts Every Flavor Beans, a feast at the Hogwarts dining commons, or a stew cooked up by Mrs. Weasley, food and drink were an integral part of wizarding life. Are you wondering what pumpkin juice or butter beer really taste like? Here are some recipes, although I think I would prefer some "Cornelius Fudge". If you are looking for a cook book that will teach you to cook home-style meals that are simple, delicious, versatile and as wonderfully varied as world cuisine itself can get, look no further than Mark Bittman's Quick And Easy Recipes From The New York Times. In a moment I'll tell you why I chose those adjectives for the book, but first let me say a few words about this extraordinary and talented food writer. Mark Bittman has been writing his food column for the NY Times called The Minimalist for the last decade or more. It can be found online here, and I recommend you bookmark the page and visit it weekly, as I do. Bittman's articles usually profile a specific recipe, and feature a short three or four minute video in which he demonstrates the cooking technique or assembly of the dish in a refreshingly straightforward style (and often a bit of tongue in cheek humor from Mr. Bittman as well.) If I were The Grand Poobah, I would ordain that the NY Times make a compilation of these short videos available for sale. I would purchase it over anything on offer from, say, the Food Network. Links to recipes are available too, but after a few weeks the online Minimalist articles are archived and one must become a paying subscriber to have access. The Minimalist moniker Bittman has chosen is not only pertinent for his style of cooking, it represents the essence of his food philosophy, which is: Good food need not be complicated, exotic or baroque in it's ingredient list. Rather, good food is that which relies upon good, fresh ingredients, time honored techniques, and which Bittman prefers to reduce to it's simplest components to deliver the biggest and most essential flavor of the dish. Thus " the Minimalist. " One might think that a minimalist approach to cooking would yield a paltry list of standard fare, but in Bittman's approach just the opposite occurs, because with each recipe he often provides one two or three variations on the theme (an added ingredient here, a substitution or two there), to yield a fantastic variety of flavor possibilities and an education in cooking while you are at it. As a home cook, a self named Rookie Cook even, I have come to deeply appreciate what Mark Bittman's approach is teaching me about food. And I love that he draws upon the wisdom and respect for home cooks the world over for inspiration and recipes. He has literally opened up the world of cooking for me, in a way that is approachable, not overwhelming or arcane like many other cook books. Following Mark's "themes and variations", I find that learning a basic dish can be something I build upon, whether it is a soup or a saute or a dessert. ... the possibilities are endless. Here's an example from the section on soups. He shares the theme and variations on "egg drop" type soups, then shares variations from Asia and Italy. Then he gives his formula for any cream soup: Three parts liquid stock, two parts vegetables, one part dairy such as cream, milk, yogurt, etc. Simple and brilliant! This new book includes virtually all of Bittman's Minimalist articles, which were previously published in three separate volumes titled The Minimalist Cooks at Home, The Minimalist Cooks Dinner, and The Minimalist Entertains. If ever there was a cook book to add to your library, this is it. I have a feeling it will be my "go to" book in the coming year when I want to put something on the table for my family that I know they wil enjoy and maybe even be surprised by. I love, love, love this book. Now that I have gotten that off my chest, let me tell you why it deserves to be purchased, studied, underlined and used as a guide to your next foray into a well stocked wine store. Don't be put off by the breezy title and very readable text. This book is packed with not just information about the world of wine, but the author's deep and appreciative knowledge of wine. Using her ongoing conversation with Rolling Stone movie critic Peter Travers as a ruse, Teague treats her readers to a mind expanding and encyclopedic approach to the subject that goes far beyond naming the six Basic Grapes and how to recognize and pair a balanced wine with food. What I loved most about this book was the fact that the author took me on a fascinating tour of every place in the world where wine is produced, and explained in detail why that region is important, how the wines are (or are not) organized for the consumer, and what makes them distinctive. But this is not just a geography lesson; this is the meat of the book and this is what will enable the reader to make informed purchases at the wine store. Amazingly, Teague manages to convey this information in just the right amount of detail, in a highly readable and simple (but not over simple), way. The first of these chapters covers France, beginning with a lesson on the Bordeaux classification system of wines and how to navigate it wisely today. Here were the names of famous wine producing chateaux I recognize, but for the first time in my life Teague puts those names in a context I can begin to understand. She describes the differences between the left vs. the right bank of the Gironde estuary, their chateaux wine styles, the first through fifth growth classes of wines and what it means. She then goes on to describe the other major regions (Burgundy, Cote D'Or, Alsace, the Loire Valley, the Rhone Valley, Champagne), with notes on specific producers of wines she recommends in each area. The section on France alone is well worth the price of the book. But Teague goes on to describe the complex and fascinating wine making environments of other Old World Wines of Italy, Spain, Portugal, Germany, Austria and Hungary. The next section of the book treats the New World Wine regions: Argentina, Australia, New Zealand, South Africa, Chile, New York State, Oregon and Washington State, and California. Throughout, she gives her readers the inside scoop on where to look for good value wines at affordable prices. But Teague's book is not simply a superb world tour of winemaking (and it is that). She begins with brief but vital chapters that address such questions as "What makes a wine great?" and "How to Taste Wine". Instead of distracting the reader with a laundry list of scent and taste descriptors to search for in a glass of wine, Teague puts even the act of tasting into a context of the total experience, and how to maximize that experience. There is real wisdom here. There are little bonuses of information I can use throughout the book. For instance, Lettie Teague informs us how the shape and color of the bottle gives important clues about the type of wine it holds. Is the bottle neck wide, or narrow and sloped? Is the glass clear or deeply opaque? I will never look at a wine bottle the same way again, and now can read it's clues at a glance as I wend my way through a store. I love wine, but I confess that walking into a wine store has, in the past, filled me with a sense of being overwhelmed and intimidated by the bottles on offer. Now, after reading Teague's book, I feel excited and curious. I can hardly wait to make my next visit to a well stocked wine store. I feel ready to begin to explore the world of wine in a completely new way, with a sense of context and anxious to discover that elusive sense of "terroir" in a wine I keep hearing about. Now, instead of thinking merely "red or white, and which grape variety will complement my menu plan?" I will think "Which region of the world do I want to taste, and which apellation is likely to please my palate as well as my budget?" I plan to use Teague's book as a guide for my exploration. At the end of Teague's book, there is a multiple choice quiz for her friend Peter (and the reader) to test what we have learned. Through the test, the author winks at us but also indicates the enormous amount of ground covered in the book. And although I was not always charmed by the use of Peter as a learning companion, his metaphors from the movie business as an art form to help me understand what Lettie was saying was useful and at times entertaining. My one suggestion to improve the book would be the inclusion of maps. Highly recommended. Buy it here. Popeye's Poison: Spinach and e.coli and parasites, Oh my! When I first heard the news about the spinach tainted with e.coli, I thought I was safe. I had just bought a large bin of salad greens, including spinach, from an organic grower named Earthbound Farm Organic. Then I read the names of labels affected by the epidemic, and--horrors!-- Earthbound Farm was one of the brands affected. Earthbound Farm's web site details what they intend to do to insure the integrity of their produce in the future. I feel myself greatly encouraged by the steps they will take, including the "firewall" of testing all their produce before accepting it. Shunning spinach in the mean time, I again purchased some packaged romaine lettuce--this time the "Foxy" brand. The very next day, that brand of lettuce was recalled voluntarily as the producers seek to ensure no tainted produce is unwittingly fed to the public. Once again I find myself throwing out unopened bags of produce and feeling glad we have begun growing our own vegetables this year. And now for a book review that you can file under the category of "EEeeewwwww!!!!" Yet this is truly a book worth reading. "Guess What Came To Dinner? Parasites and Your Health" is a slim volume packed with information we dare not ignore due to its unpleasant nature. The author is Ann Louise Gittleman, a highly respected nutritionist who has become a foremost teacher on the effects of toxicity and weight loss through cleansing the body, most especially the liver. Ms. Gittleman states that parasites are frequently undetected, undiagnosed, yet often the culprit in unexplained maladies and symptoms such as weight gain, fatigue, gastro-intestinal problems, bloat, anxiety and depression. The American myth is that parasites are only an issue in third world countries or poverty stricken regions. But the increasing prevalence of travel to exotic locations, immigrants, the consumption of previously considered exotic foods, (sushi anyone? ), as well as children being in day care centers, activities such as gardening and even the family pets such as dogs and cats... well, you get the picture. Parasites exist everywhere, and it behooves us to protect our clean water supply and use "common sense" when it comes to hygience. I was a little freaked out when I read Gittleman's book. She even recommends a protocol of soaking foods in a water bath treated with Clorox bleach previous to consumption. At first I thought this was overkill. Now that I have thrown away two batches of potentially lethal produce I'm less skeptical. I haven't used the Clorox bath on the food yet... but I am considering it. I have been planning on writing a book recommendation for "Parasites and Your Health" for some time now. Then this past week at the grocery store I saw this on the cover of "First" magazine: "Are Parasites Making You Fat? 1 in 3 Americans Are Affected." The article names Gittleman's book as well as other resources. Despite the alarmist title, I can't help but wonder if the obesity epidemic in our country is partly due to the toxic load of our water anad food supply--including parasites. Like the old saying goes: "Just because I'm paranoid doesn't mean they aren't really out to get me." Well OK, maybe no one is targeting us. But my intuition tells me that Someone, Somewhere knows that dangerous agricultural practices are being utilized and the public is paying the price. Consumer beware... and whenever possible you might want to start a garden. Kate over at Accidental Hedonist has more good reportage on the e.coli outbreak--it's worth reading.